“I fell into a burning ring of fire”…a classic Johnny Cash song lyric. I like to use it to explain how chicken, beef and fish feel when cooked in an oven or on a range top where the heat has been set too high. It’s a recipe for turning a gorgeous cut of meat into something that tastes like the cardboard packaging for an old vinyl record. 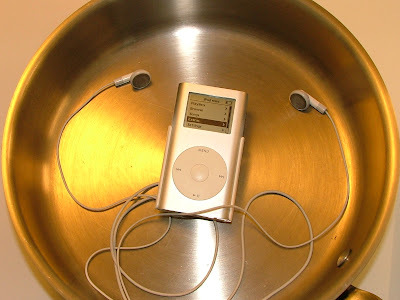 The trick to cooking meat or fish is to treat the settings on your oven or range top like the volume dial on your ipod. My guess is the volume setting for most people's ipods is regularly positioned somewhere around the middle. For some the volume may be slightly higher and others it could be slightly lower. However I doubt few people regularly listen to their ipod on the highest volume. Basically because it does dangerous things like blow out your eardrums. Conversely if you set the volume too low, you'll be hard pressed to distinguish Snoop Dog’s “Shnizzle” from his “Wizzle”. The same holds true for cooking meat and fish dishes on the range top or in the oven. When browning meat in a skillet, a medium setting will allow the meat to brown and caramelize. More importantly, you’ll feel in control. If you set the heat dial too high, crazy things begin to happen. The oil smokes, your food turns black instead of brown and suddenly the whole cooking experience begins to feel out of control! The oven works the same way. Most ovens can go up to 550ºF. However if you flip through any cookbook you’ll notice the majority of the poultry, beef and fish dishes are cooked in the oven in the 325ºF–375ºF range, which of course is somewhere in the middle. There are always exceptions, but keep this ipod thought in mind the next time you cook poultry, beef or fish and there’s a good chance it'll turn out moist and delicious!